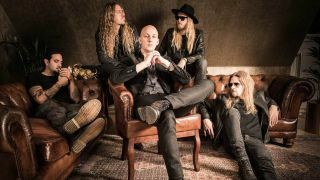 Soen have announced plans to release their fourth studio album early next year. The Swedish-based progressive metal outfit will launch Lotus on February 1 via Silver Lining Music and then embark on a European tour throughout March and April. Drummer and percussionist Martin Lopez says: “We are all very fortunate to have this place where we can go and explore thoughts, perspectives and emotions which everyday life maybe does not have the room for. The band record the record with producer David Castillo and Iñaki Marconi at Ghostward Studios and Studio 6 earlier this year, with the new record Soen’s first with Canadian guitarist Cody Ford. As for the direction of the new material, Lopez says: “The world right now is undeniably a very strange, tense place. Lotus pre-orders will begin on Friday, November 16, while the band’s 2019 European tour dates can be found below. In September this year, Soen revisited their third album Lykaia, which featured live tracks from their 2017 European tour and also included updated cover art by Paul Tippett.